We did a double-take when we first saw the photo here for linguini with roasted beets, fresh tarragon and caraway. It’s stunning! We’re betting it would warm the heart of any dad this Father’s Day … or any day. And you don’t have to be a dad to like this pasta. It’s literally a conversation stopper when brought to the table. Roasted beets are a favorite of ours. (You can find more beet recipes in our In Season eNewsletter by clicking here.) And so the idea of using roasted beets for pasta gets two thumbs up. 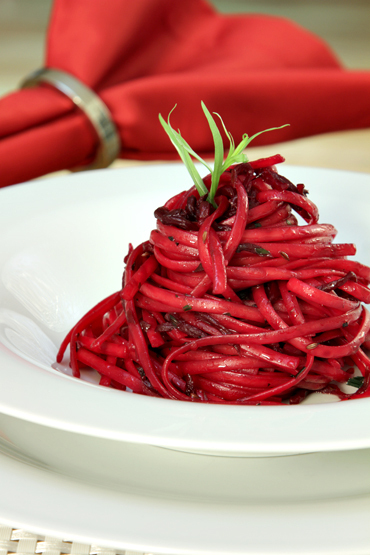 Viviane describes the flavors of this linguini as “intense.” The roasted beets are julienned and then sautéed at high heat with caraway seeds until they caramelize. That gives the beets a “deep, rich, earthy flavor that’s irresistible,” writes Viviane. She takes the flavor up a notch by adding balsamic vinegar to the skillet just before adding the pasta. The vinegar is reduced so that it glazes the beets. Viviane adds fresh tarragon that’s tossed with the pasta. “It picks up on the flavor of the caraway seeds and brightens the dish with its exquisite, fresh aromas,” she writes. The dish gets a finishing drizzle of extra virgin olive oil. Thinking ahead, it occurred to us this linguini would be perfect for Valentine’s Day. Then again, we’re not waiting until then to prepare it ourselves.